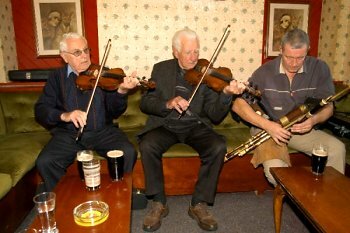 John Vincent Harrison, who has died aged 82, was a master Leitrim fiddle-player whose expertise and extensive musical connections linked him with a golden era in Irish fiddle music. He was an associate of James 'Lad' O Beirne (1911-1980) the renowned Sligo fiddle-player who lived in the Bronx, New York and who in turn was a contemporary of the fellow county fiddle-player Michael Coleman (1892-1945). Vincent Harrison was born in 1927 into a farming family in Tullycooley, Dromahair, County Leitrim. His mother Mary played the fiddle and her son took to the task of carrying on her legacy with an application and devotion that remained with him throughout his life. Mary's brother was the well-known fiddle player Hughie Travers, whom Irish musicians will recognise by the tunes that bear his name. Vincent was not formally taught music by his mother but started on fiddle from an early age and 'picked it up as he went along'. Besides his mother, he linked up with the great fiddle-player Joe 'Lacky' Gallagher from Drumkeeran and supplemented that by listening to 78 rpm recordings from the USA of Coleman. He began entering and winning local feiseanna and playing regularly at dances and various events in Leitrim and further afield. By the age of 27 he had decided to leave farming life and emmigrate to New York. There he had an older brother Joe, an avid music lover, who told him of a great Sligo fiddle-player named James 'Lad' O Beirne who was to become a close friend and abiding influence on the young Harrison. Indeed, subsequent recordings can still be heard of the two playing many tunes together on an innovative O'Beirne home-made recorder. Vincent absorbed an enormous amount of lore, history and most importantly music from O'Beirne, Tom Connolly, Andy McGann and Martin Wynne, who all had direct contact with Coleman. He went on the play with fiddler-players Andy McGann and Paddy Reynolds, piper Andy Conroy and many more well-known Irish musicians in a city rich in Irish musical tradition. In 1988 he retired and returned to Ireland to live near his sister Moira and her family on the seafront in Clontarf, Dublin. He immediately immersed himself in the musical scene and played at many events and festivals at home and abroad. He also made radio braodcasts and some commercial recordings. His house was to prove a mecca for many calling musicians, in particular, younger gererations of musical families like the Mulligans, O Broins and O Connors, for the remnainder of his life. He was always generous and kind with his time and music, for young and old, and carried his unique musical legacy with pride and honesty. His style of playing and his link with the golden era of Irish fiddle music made Vincent Harrison one of the last true exponents of the celebrated Coleman style. Vincent is survived by his two sisters Moira and Philomena and his many nephews and nieces. Ar dheis dé go raibh a anam uasal ceolmhar.